The destruction of transit in the East Bay and across the Bay Bridge was, unfortunately, typical for California's other large metropolitan areas. The only large city in California where GM did not destroy the transit system was San Francisco. This was because it was not able to do a takeover: San Francisco's transit system was owned by the City. Of course, GM was savvy enough to not directly buy these transit systems. They used "front" companies, funneling the money through them, and when they achieved control, it was the end for the transit system. All without the public's knowledge. What about the San Jose streetcar system? GM has admitted to making an "investment ... in Pacific City Lines beginning in 1938 ..." [in GM's report "The Truth About American Ground Transport," page 21]. San Jose Railroads became a subsidiary of Pacific City Lines [Moody's Manuals]. The streetcar service was discontinued on April 10, 1938. Harre Demoro of the San Francisco Chronicle writes [in his book The Key Route] : "Pacific City Lines was headquartered in Oakland and specialized in acquiring smaller transit systems and converting them from rail to bus. The Key System was among its largest targets at the time [January, 1941], and [Key System president] Lundberg moved quickly to avert a takeover." This 1941 takeover attempt was only made publicly known at a PUC hearing in 1955, because the request by the Key System (GM-controlled) attorney to delete it from the public record was denied. The Key System was not so lucky in 1946. General Motors has admitted to making "investments" in National City Lines in 1939 and other years (which they didn't all list). This "front" company, National City Lines, acquired 64% of the stock of the Key System (officially the Railway Equipment and Realty Company) in 1946. The destruction of this transit system is detailed in previous pages. General Motors has admitted that "GM made ... investments in American City Lines in 1943." Soon, American City Lines was buying stock in Los Angeles Railway. By May 1, 1945, they owned 59% of the outstanding stock. The same month, the Los Angeles Railway announced plans to scrap most of the streetcar lines [Source: Moody's]. Pacific Electric was acquired in 1953. By then, a number of lines had already been acquired and destroyed via Pacific City Lines [Source: Hearings before the Senate Subcommittee on Antitrust and Monopoly: American Ground Transport, 1974]. The Hollywood Blvd. 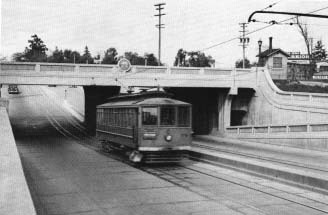 line was destroyed in 1954 and the Glendale-Burbank line in 1955, both using the subway under downtown LA. On March 12, 1949, General Motors was convicted for monopoly and violating antitrust laws by a federal court. It was fined merely $5000. The fine was not enough to dissuade GM, because the destructions continued using more elaborate "fronts." For example, the selling of the San Diego streetcar system in 1948 (when GM was under indictment), with 104 streetcars, was "to J. L. Haugh, Oakland, for an undisclosed amount" [Moody's Public Utilities Manuals]. Who is this person? The Key System president installed by GM! Previous to that, he was an executive at Pacific City Lines. San Diego's streetcars, which were the new PCC type - still being used to this day in San Francisco - were scrapped in 1949. That's not all for J. L. Haugh. In 1953, Jesse L. Haugh "acquired" the Pacific Electric. The real financiers of the takeover were again hidden from the public at the time, but became known later by congressional investigation. It also meant that what was once a private company, making profit and paying taxes, eventually became both government owned and government subsidized, after GM destroyed both its efficiency and its customer base. This process was repeated in other of GM's transit operations in California. The transit companies also had owned much of the property under their tracks, and paid property taxes which roads never paid. Taxpayers to this day are burdened with subsidizing bus systems. To a much greater extent, they are burdened with subsidizing automobiles whose numbers are far greater than if the electric systems - with streetcars, trains and trolly buses - had remained intact.